Admiral McRaven speaks to Know Your Value about why his message is so important -- particularly for millennials. “If you want to make a difference in the world, start by making your bed.” That was the premise of a commencement speech delivered by Admiral William H. McRaven at the University of Texas at Austin in 2014. It has since gone viral with over 10 million views and has been referred to by some of the world’s best thought leaders. McRaven’s address struck a chord with many because of its simplistic but profound message of starting the day right and paying attention to the smallest details. McRaven is a decorated veteran; he served 37 years as a Navy SEAL and was commander of all U.S Special Operation Forces as a four-star admiral. He’s currently chancellor of the University of Texas System. DANIELA: Based on this message of making your bed and making the small things count, do you think this message is specifically important for millennials as you compare them to other generations? And why? ADM. MCRAVEN: I think it applies to all generations. It’s very interesting because I receive emails every week, lots of them, from folks of every walk of life. Young kids who are just starting out in their teens and their dad had them watch the commencement speech. Or older folks who are later in life that will write me and say, “I always made my bed” and kind of reinforce the point. For the millennials in particular, it’s helpful because they’re the kind of lessons everyone else who has gone through life have already learned. So having the opportunity to have a simple playbook, again for millennials or any young generation, is always helpful. Making your bed is a simple thing to do. It’s about doing the little things right. It’s about starting off your day correctly. These lessons are important for every walk of life, but especially for younger folks just getting started on their journey. DANIELA: As a commander in the Navy, you worked with millennials. What was your experience managing them? What did you learn about their strengths? ADM. MCRAVEN: I’ll tell you, I love millennials. I think that surprises folks, but here’s what I saw in the military and I see the same thing now running the University of Texas system. In the military, millennials came in. They look different than my generation. They had tattoos, earrings, listened to music I don’t understand. I tell you, given some order and discipline, which the military does well, they were focused. They were committed. They made their parents and grandparents proud with their sense of patriotism and duty. Particularly, the kind of post 9/11 kids who came in were all-volunteer military. So number one, they volunteered. I think this is more so a millennial quality than mine, the baby-boomer generation. They like to volunteer. You see them volunteering for these tough challenges of joining the military. They come in, they’re committed, they like to work through tough problems. I saw these things and was impressed by the millennial generation. Now at my perch here at the University of Texas system, I see the same sort of thing. They come into all of our schools. They want to go out in the world and change things. They want to be entrepreneurs, do start-ups. At the same time they want to be the best lawyer, doctors, anthropologists, journalists they can be. I see the millennials with a lot of energy. I’ve seen the best of the millennials and I love the generation. DANIELA: What would you say to those millennials in entry-level jobs, not in the military where they are trying to find purpose in the little things? Maybe, they don’t understand why they’re fetching coffee or doing, what may seem like menial tasks on a computer. How does the message of your book transcend to those millennials? ADM. MCRAVEN: It’s a lot about teamwork. It’s recognition of, we used to have a saying in combat: Your proximity to the fight was not your value to the organization. It’s essentially the fact that, I don’t care if you’re if you’re an analyst working in the United States. Just because you’re not the Seal or Ranger in the fight, you’re still of incredible value to the guys and gals in the battle field. Proximity in the fight has nothing to do with your value to the organization. I had military aide-de-camps, young army green berets. Their job is much like that-- sitting in a cubicle. They do have to get me a cup of coffee every once in a while, do some paper work, make sure I get in the right car. They seem menial, but the admiral always conveys the incredible importance of that job. If I don’t get to the right place, at the right time, with the right paper work, in the right uniform, then somehow we as a team have screwed up and he or she is a vital part of that team. DANIELA: I want to touch back on the topic of failure. I think that specifically resonates with millennials, because we do have a hard time with failure. I think that resilience is something that, more than any generation, we need to work on. In your own lifetime, how long did it take to reflect back on those experiences and find the good in something so dark? 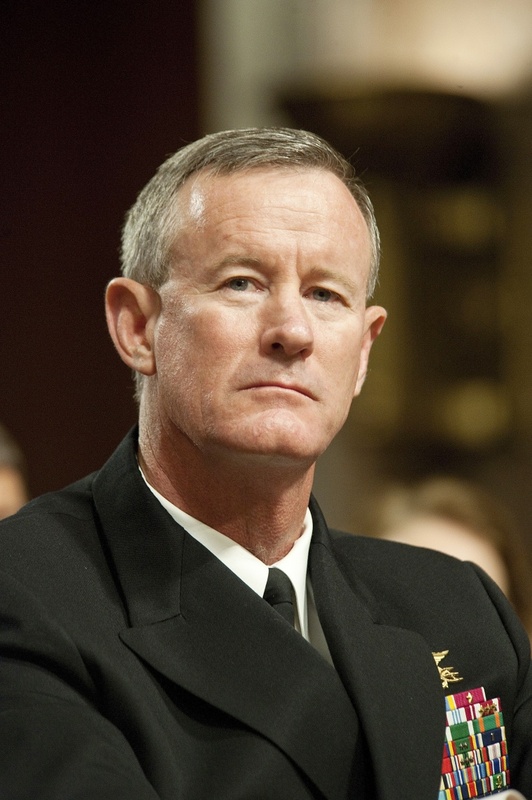 ADM. MCRAVEN: Let me tell you one thing, I think the millennials are too hard on themselves. I’m 61 years old and I remember the beatniks and the hippies, and then we started calling things by generations. Sometimes the millennials may be too introspective and that causes them to be concerned. To get back to your point on the failure, failure is a part of life. Obviously, when you have an event that happens when -- as I pointed out in the book -- I got fired. It’s particularly bad to get fired when you’re in the military. Sometimes that is very hard to overcome and to get back on course. It wasn’t just that -- I’ve had a lot of failures in my military career and my life. You have to really dig down deep and say, 'I’m better than that. I can overcome this.' You have to pull yourselves up by your bootstraps and then work harder, learn from your mistakes, and try to do better. Don’t whine about it. Another piece of this, as I also say in the book, is that it helps to have someone that helps you along. Daniela Pierre-Bravo is Know Your Value's millennial contributor. Read more about her here.